Thermally curing adhesive bonds remains an essential part of medical-device manufacturing because thermal curing provides a high degree of process repeatability. Seeking to develop a two-part polymer adhesive bonding step in their assembly process, a medical-device manufacturer in the northern United States performed extensive design of experiments (DOE) with multiple variables. The team sought to characterize the process and ensure the process met the appropriate internal, federal and international standards. The parts were sensitive to ambient humidity, so it was important to maintain tight environmental control during the thermal cure step. In addition, the manufacturer needed to use vacuum and heated centrifuges to eliminate bubbles and outgassing in the part. While the parts seemed to bond well initially, accelerated age testing revealed that in many trials, bonding strength diminished over time — as had appearance and other measures of quality. The testing result indicated that ultra-precise temperature control was necessary to ensure proper finished goods. Outside of that precise process control window, quality was diminished. Lesson learned: Temperature matters. How the curing process can strengthen or degrade a resulting bond is the focus of this article. The tradeoffs inherent with different types of adhesives and their curing methods will be discussed in an effort to establish curing best practices. In addition, the article will demonstrate that while irradiation curing is convenient, fast and allows for a simplified workflow, it often requires a post-curing thermal step. Moreover, irradiation sometimes has negative effects on the part. Adhesives used in assembling medical devices must hold reliably under many difficult stresses and strains. These adhesives must perform flawlessly inside a most inhospitable environment: the human body. Curing is the process that helps ensure adhesives remain stable. What is a Medical-Grade Adhesive? The term “adhesive” refers to the largest, most general category of binding chemicals. Adhesives generally include epoxy, acrylics, polyurethane, silicone and cyanoacrylates. Manufacture in a controlled environment such as a cleanroom. Use of bio-compatible and potentially hypoallergenic materials to help minimize adverse effects upon skin contact. Materials may have been tested and cleared for potential toxicity or irritation responses. Use of equipment validated for medical-grade uses. Curing applications in medical-device manufacturing rarely occur at temperatures above 500°F (260°C). Equipment may be designed for batch loads or for a continuous flow of work using a conveyor. Adhesive Differences Drive Curing Methodologies. Curing is an essential piece of using adhesives. The curing process is a function of geometry, base materials and the manufacturer’s recommendations for adhesive use (table 1). Each curing methodology alters adhesive qualities in some way. The key is to match the adhesive and curing method so both help achieve the desired goal. 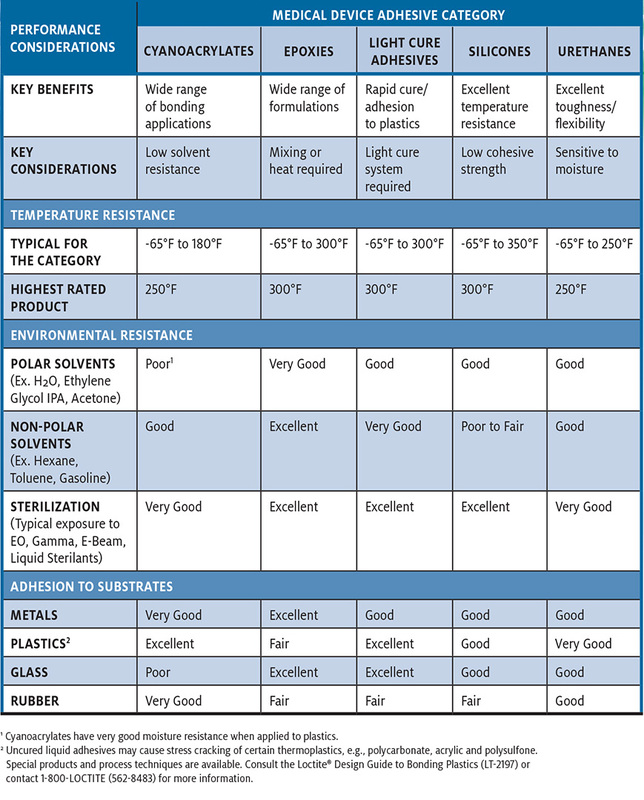 Table 2 shows a range of considerations when choosing adhesives. Light-curing adhesives utilize a photo-initiator that causes the adhesive to cure rapidly when exposed to certain wavelengths of light. The adhesives are designed to cure under an ultraviolet light source rather than visible light. This allows time for the parts to be positioned for bonding. When the light is applied to the joint, the adhesive cures in as little as one second. Most moisture-cured adhesives draw moisture from the air to complete the cure. Some specialty formulations, however, require a high humidity environment to cure properly. Adhesives used in assembling medical devices must hold reliably under difficult stresses and strains and perform flawlessly inside a most inhospitable environment: the human body. Thermal curing is a common technique used to cure adhesives. In a thermal cure cycle, the product is ramped up to a cure temperature and soaked for a specific amount of time until the bond has cured sufficiently. Cure times are shorter at higher temperatures and longer at low temperatures. Many thermal-cured adhesives can cure at ambient temperature as well, but the cure time is too long for most medical-device applications. Long cure times lead to excessive amounts of work-in-progress (WIP) on the production floor, higher costs and poorer quality control. Curing at higher temperatures usually gets better results, but the temperature is limited by the substrates as well as the adhesive itself. The adhesive supplier can help define minimum cure times at specific temperatures. Manufacturers supplying the coating typically specify the temperature needed for coating. Great advancements have been made in the formulations of adhesives over the past two decades. In fact, light-cured formulations of cyanoacrylates now are common, and formulations are on the market for light-cured epoxies, urethanes and silicones. Does that mean that thermal curing is becoming a thing of the past? The answer is no. While light curing is prevalent in high volume, noncritical applications, thermal curing remains an essential part of medical-device manufacturing. Thermal curing provides a high degree of process repeatability. Moreover, the environment inside an oven can be tightly controlled, maintaining ISO 5 cleanroom conditions throughout the cycle. Hundreds of different medical devices are in production, and most require multiple curing steps. Each step is unique, with its own set of constraints, materials, geometries and functions. For life-saving devices with high risk of failure, the manufacturing processes must be qualified by the manufacturer to ensure the device performs as required and to meet all requirements. For these critical curing steps, medical-device manufacturers often select thermally cured adhesives. Given the essential role that thermally cured adhesives will continue to play for medical-device manufacturers, a key question remains. What performance and features does a medical-device manufacturer need from a curing oven? Curing applications rarely occur at temperatures above 500°F (260°C). Equipment may be designed for batch loads or for a continuous flow of work using a conveyor. For medical-device manufacturing, electrical heat is most common, but natural gas burners, hot water or steam also can be used. The temperature controller is an important consideration. Many quality brands of PID controllers are offered on the market. For medical-device applications, a precise PID controller with multistep profile controls, process alarms and datalogging capability is desirable. Ease of use also is important. Temperature Uniformity. Temperature uniformity is extremely important in curing applications for medical devices. To ensure process quality, it is essential that the process is repeatable and that all parts encounter the same temperature profile, regardless of position in the oven chamber or on the conveyor belt. Overall temperature variation in the oven workspace is one definition of temperature uniformity, which is generally stated as ±°F/±°C at a given setpoint temperature. A nine-point temperature uniformity survey can be used to qualify an oven, measuring temperature in the center of the oven and in the corners of the workspace. Uniformity of ±5°F to ±10°F usually is required for these applications. Airflow. In general, higher rates of recirculated air result in better uniformity. Wall Losses. Insulation thickness varies with maximum temperatures and the uniformity required. Air Distribution. Oven airstreams are designed for heating prior to mixing with air in the work chamber. Air that has not been sufficiently mixed will exhibit temperature stratification, which detracts from uniformity. The obvious advantage of tight oven temperature profile uniformity is that all parts within the oven will be subject to the same temperature. This helps ensure consistent product quality. The tradeoff with tight uniformity, however, is cost. Ovens designed to satisfy tighter uniformity standards are more expensive. Heat Transfer Methods. Heat can be transferred to the work by forced convection, natural convection or by radiant heat sources. Forced convection provides better uniformity control than natural convection (sometimes called gravity convection). As a result, forced convection is better than natural convection for high-cost-of-failure devices such as those for medical applications. Radiant heat (infrared) is an efficient way to deliver heat to a part, but it provides relatively poor temperature control. It is critical that the oven used for thermal curing of medical devices be able to deliver the uniform and repeatable thermal processing needed for critical components. Atmosphere and Filtration. In addition to different types of heat transfer, heating equipment may be designed to contain inert atmospheres with nitrogen to prevent oxidation of parts during a soak at elevated temperature. This is accomplished by purging the chamber with nitrogen gas prior to enabling the heater. Oxygen levels of 10 to 100 ppm can be achieved in a well-sealed oven. HEPA filtration also is important in many medical device-curing processes, where foreign matter (FM) on a part can result in rejection of that part. An oven with HEPA-filtered recirculation air can maintain ISO Class 5 cleanroom conditions. HEPA filters tend to be less efficient during temperature changes, so it is important to limit ramp rates on HEPA-filtered ovens to maintain the desired cleanroom conditions throughout the entire profile. Safety. When used properly, an industrial oven is a safe piece of equipment. The obvious hazard is due to the inherent temperature hazards, but there are hazards associated with the adhesives that go into the process as well. When curing adhesives, the oven should be well ventilated and exhausted outside to ensure any byproducts of curing do not affect operators. Another risk related to adhesives is the risk of explosion due to solvents that may be in the adhesive formula. Most of the adhesives discussed have little or no solvent in them, but some do. It is always important to know what you are putting in the oven and understand the safety measures needed to address the risks they pose. If the adhesive going in the oven contains solvents in the formula, a Class A oven conforming to NFPA 86 is essential for safe operation. A Class A oven will have a purge timer, a proven forced exhaust, an explosion-relief panel and labeling that identifies a safe batch size for that oven. In conclusion, when manufacturing medical devices, the stakes could not be higher. Thermal curing is a superior method to other forms of curing adhesives. It is critical that the oven used for thermal curing can deliver the uniform and repeatable thermal processing needed for critical components to operate flawlessly and ensure reliable product performance. 1. Panacol Adhesives. “Medical Grade Adhesive.” 2018. https://www.panacol.com/adhesive-applications/medical-grade-adhesive/ (accessed February 16, 2018). 2. Cova Scientific. “Medical Grade Adhesives & Sealants - A Biocompatibility Guide.” 2015. https://www.covascientific.com/blog/medical-grade-adhesives-and-sealants-a-biocompatibility-guide (accessed February 16, 2018). 3. Tavakoli, M. “The adhesive bonding of medical devices.” Medical Device and Diagnostic Industry June 1, 2001. https://www.mddionline.com/adhesive-bonding-medical-devices (accessed April 23, 2018). 4. Henkel Adhesives. http://henkeladhesivesna.com/henkelna/10491_AssureCure_Chart316188.jpg (accessed February 24, 2018). 5. Salerni, Christine. “Selecting Engineering Adhesives for Medical Device Assembly.” Medical Device and Diagnostic Industry June 1, 2000. https://www.mddionline.com/selecting-engineering-adhesives-medical-device-assembly (accessed February 28, 2018). 7. Nandivada, Venket. “Silicone Adhesives for Medical Device Assemblies.” Medical Design Briefs December 1, 2016. https://www.medicaldesignbriefs.com/component/content/article/mdb/features/26073 (accessed February 28, 2018). 8. Frick, Lindsey. “Epoxies for Medical Device Applications.” Machine Design March 26, 2014. http://www.machinedesign.com/adhesives/epoxies-medical-device-applications (accessed February 28, 2018). Adhesive bonding of components used in medical devices has steadily increased and displaced mechanical fastening methods. This increase is due to the cost reductions available and the drive toward miniaturization. Adhesive curing is difficult to define in few words, because of the many types of adhesives and the multitude of formulations within each type. Some of the most prevalent adhesive families used in medical devices include light-curing adhesives, cyanoacrylates, silicone and epoxy. Light-Curing Adhesives. Light-curing materials (LCM) can cure in as little as one second when exposed to intense ultraviolet light of a specific frequency. These materials are used extensively in the manufacture of medical devices because the materials can be applied and positioned easily, then rapidly cured to set the bond. Typical applications include syringes and catheters. Another medical application is rapid curing and bonding of dental fillings. Shadowing can be an issue with acrylic-based LCMs because all surfaces need to be exposed to light to initiate the cure. Light-curing cyanoacrylates can lessen the effects of shadowing because they cure quickly in tight gaps where light cannot penetrate. While irradiation curing is convenient, fast and allows for a simplified workflow, those adhesives often require a post-curing thermal step. Cyanoacrylates. Super Glue is the most recognized of this category of adhesives. Cyanoacrylates cure by exposure to moisture, which polymerizes the liquid, rapidly creating a strong bond to the substrates. Widely used in syringe manufacture, these adhesives cure rapidly, so application time is short; however, they require a tight gap between bonding surfaces. They are very sensitive to humidity levels in the air and pH level of the substrates. They can be fragile and brittle. Because of that, they may not be suitable in applications that require high flexibility, chemical resistance or high temperature. Urethane. Medical-grade polyurethane encapsulants or adhesives are used in many medical devices such as catheter tips where toughness and flexibility are important. These materials cure through a reaction of alcohol and an isocyanate. They are sensitive to moisture during curing, however, and surfaces may require application of a primer to ensure proper bonding. Silicone. Silicones are highly flexible, seal well in moist environments and exhibit among the highest temperature ratings of any adhesives at 662°F (350°C). This makes them well suited for making seals or other molded parts. They also are suited for bonding, sealing or potting disposable or reusable medical devices or external medical equipment like infusion pumps, catheters and syringes. Silicone does not degrade under chemical or radiation sterilization and stands up to many cycles of repeated autoclaving. Only silicone adhesives can bond to silicone substrates. Silicone cures via exposure to moisture in the air. It can cure at ambient temperature or at elevated temperatures and light curing formulas are now available. Epoxy. Epoxy can be provided in a wide range of formulations, making this type of adhesive a versatile polymer for medical devices. Epoxies adhere to many substrate materials, and some formulations are resistant to repeated autoclave cycles. Most epoxy formulations are two-part mixtures consisting of a resin and hardener, and heat curing is common to speed the cure and enhance the crosslinking to achieve the best properties. One-part mixtures are available and are more convenient to use. These have inhibitors mixed in that are eliminated during a heat cycle, allowing the cure to proceed. Advanced applications for epoxy include underfilling and potting delicate microelectronic circuits in miniaturized medical devices. Rolf Kragseth is an applications engineer with Despatch Industries, Minneapolis, a manufacturer of industrial ovens and other thermal products. The company can be reached at 952-649-5289 or visit www.despatch.com.